Eight of us met our guide Linda for a fascinating tour of the collection which is housed in a purpose-built Gallery. General John Guise bequeathed his collection of over 200 paintings and almost 2000 drawings to his former college, where it arrived after his death in 1765, (against the wishes of his family). There is a portrait of the General by Joshua Reynolds in the Back Gallery. The tour started in the ‘Red Gallery’ where many of the paintings came as a gift from W. H. T. Fox-Strangways and reflect his taste for 14th century Italian art, a preference which was unusual at that time. Many of these pictures had been removed from altar pieces or been cut from larger works. Linda explained some of the methods and imagery used in these paintings, including The Wounded Centaur by Filippino Lippi and Five Sibyls Seated in Niches by Botticelli and Lippi. We moved on to the Back Gallery to see a statue of General Guise and the Butcher’s Shop by Annibale Carracci which had hung previously in the College’s kitchen. We also saw The Scullion by John Riley, a painting which at the time was unusual, as it is a portrait of a servant, and was hung in the Masters’ Dining Room. Once the tour had finished, we were able to stay on to revisit some of the pictures which we had seen and also to explore the selection of drawings that were on display. 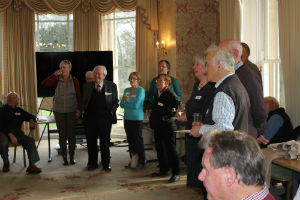 Around 40 members attended the AGM and Spring Party held at Headington Hill Hall on Thursday, 14th March. 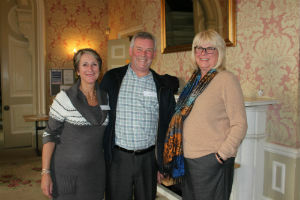 The afternoon began with the AGM at which the committee reported on the various events that took place last year and thanked Sue Piggott and Laura Spira for their time on the committee as they have both stood down. There were various discussions in AOB about what members may, or may not, have access to within the university and these are being checked and will be circulated, if there are any. Clare Fox, Chair, reported that a new “ordinary” member is needed to join the committee as with the standing down of Sue and Laura, there are only 2 currently. She also said that the 3 current officers, Chair, Secretary and Treasurer will also be standing down at the end of their period of office in 2021 so, as a matter of urgency, there is a need for others to volunteer to ensure the continuation of the Society. It was with sadness that the passing away of Professor Derek Elsom earlier this month was reported. Amongst his roles at Oxford Brookes, Derek established himself as a leading international authority on urban air quality management and undertook research into severe weather. He was conferred with the title of Professor by Oxford Brookes in 1994. Derek was appointed Dean of the School of Social Sciences and Law in 2003 as well as Dean of the Westminster Institute of Education in 2009. In 2010 he became Pro Vice-Chancellor and Dean of the Faculty of Humanities and Social Sciences until his retirement in September 2012. Many of those at the event knew and had enjoyed working with Derek over his time at Brookes. 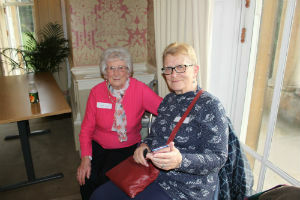 The meeting was followed by the Spring Party and, as always at these events, there was a happy buzz of conversation as members chatted over the prosecco, sandwiches and cakes. During the party Professor Anne-Marie Kilday, Pro Vice Chancellor for Staff and Student Experience, spoke on behalf of the Vice-Chancellor and gave updates on campus developments, the latest round of University rankings, the staff and student experience, the effect of the uncertainty around Brexit, the Augar review and the University’s future priorities. It made for interesting listening and discussion afterwards, and members came away realising that it seems the same priorities and concerns are still uppermost within Brookes. Twelve of us met at Bicester Park and Ride for our visit to the Energy Recovery Facility at Ardley. Because of parking restrictions at the Centre, we car shared the last few miles as we had been asked not to bring more than 4 cars. 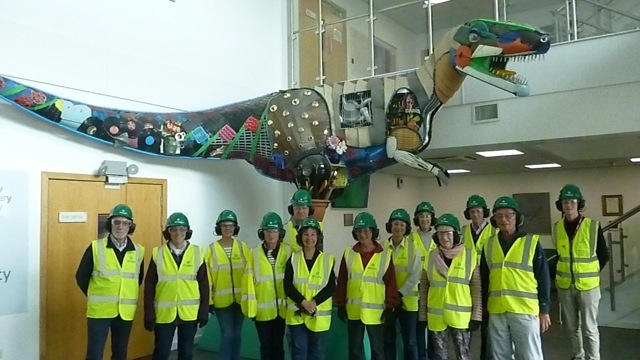 Once there we regrouped in the Visitor Centre under a huge recycled Dinosaur called Meg. Whilst we drank some very welcome tea and coffee in the teaching room , we listened to a briefing by the Centre’s Learning and Visitor Centre Manager, Jessica Baker-Pike on the various ways to recycle or reuse waste. This was followed by a tour of the facilities decked out in in high visibility coats, safety glasses, hard hats, safety gloves and headphones. Our first stop was the Control Room where a bank of computers were being used to monitor every stage of the process inside the facility – from the delivery of the rubbish, the lifting of the rubbish with giant grabbers, to the production and filtering of gases, the production of ash and aggregate for the construction industry and the electricity generated which is fed into the National Grid. Apart from the giant storage area at the beginning of the process where the rubbish was deposited, the rest of the process took place within metal pipes and cylinders so not much of the process was visible. However, we learnt a huge amount about waste disposal –either to be recycled, incinerated or for composting. Particularly impressive is the generation of electricity which is now able to power 38,000 homes in Oxfordshire. A far cry from the old days when waste disposal was largely deposited in landfill. At 11.30 am on 20 June, 12 of us gathered at Thame Museum to meet Tony Long, our guide for the Midsomer Murders Walk around the town. He is one of 6 volunteers that undertake these walks that can all be booked at the museum (along with other guided walks) with the small charge they make going to charity http://www.thamemuseum.org/ All 6 are members of the Thame Players and his acting enthusiasm was evident with his entertaining repartee as he escorted us around the town. He began, in the museum, with an introduction to the town and Midsomer Murders. There have been 118 episodes of the television series which began in 2001, and there will be 4 more this year. They have been watched by over a billion people in 100 different countries. An actor called Elizabeth Spriggs was in the first episode and she came from Thame and is buried in St Mary’s churchyard, along with Robin Gibb of Bee Gees fame who was a resident of the town. His home, the Prebendal, has been used in a few episodes of the series. We were shown various locations used around the town, including the lane to the churchyard, the cricket pitch and different shops in Buttermarket and the market square which had their frontages changed. The public loos have quite an imposing entrance which had also been used for different scenes! We finished at the Town Hall which even has its own sign for the series! As well as the buildings used for the series Tony talked about the history of others, including the Bird Cage pub which had been in existence since the 1400s where at one time leopards were kept in the attics, and later on Napoleonic prisoners of war in the cellars. An enjoyable and informative way to spend an hour and a half and we finished with a delicious? lunch in The Black Horse, a local pub recently taken over by the Raymond Blanc group (he of Le Manoir Aux Quat’ Saisons fame). On 23 May, 17 Brookes Society members met at Pizza Express for lunch and, after a brief introduction to the Jewish history of mainly medieval Oxford, went with our guide Pam Manix, on a 23/4 hour walk around the city. We were almost overwhelmed with information, Pam certainly knows her stuff. As the Project Historian, of the Oxford Jewish Heritage Committee, she leads these walks regularly, and also conducts her own research into this area of history. She was able to give us chapter and verse about many buildings and their inhabitants particularly round the St Aldate’s area, and on our way we visited the Town Hall, and Pembroke College. We also walked along the notorious Dead Man’s Walk in Christ Church Meadow, which was the route taken by Jews to bury their dead in the Jewish Cemeteries, the first at Magdalen College, later replaced by the one where the Botanic Gardens is now situated. The walk was very enjoyable, although a bit tiring for some of us old lags. For those who are interested and didn’t come to this event, you can go to www.oxfordjewishheritage.co.uk, where you can find a self guided walk, and discover the guided tours available by Pam and her colleague. 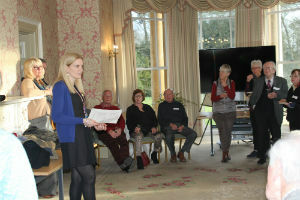 I attach a picture taken at Carfax of Pam with her rapt audience!